On the last full day of our time in Sapporo, M and I were faced with a dilemma. 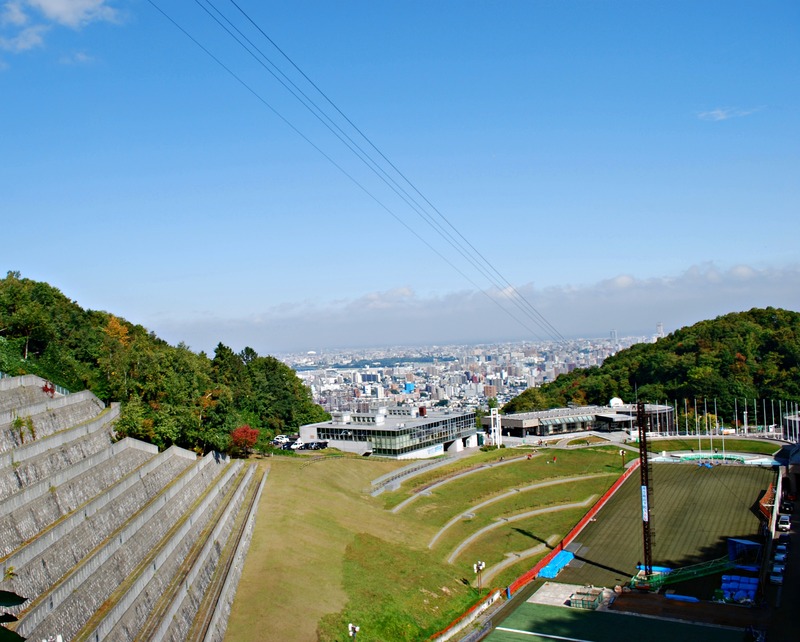 Should we spend the morning at the Okurayama Ski Jump Stadium or at Moerenuma Park? Although our itinerary had initially included visits to both attractions, somehow we hadn’t managed our time as well as we should have and now we only had time for one. I was leaning towards Moerenuma Park because it was designed by the famous sculptor Isamu Noguchi and it looked gorgeous in pictures. 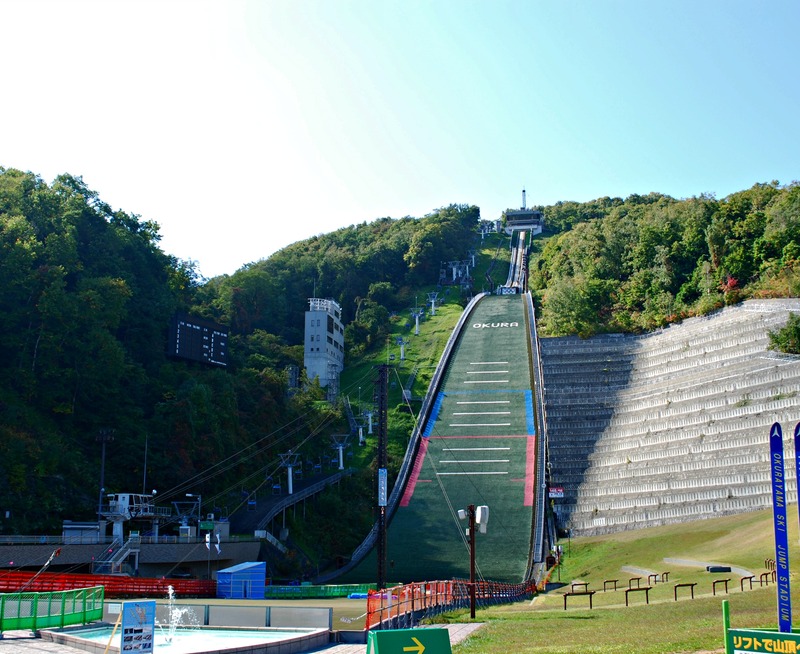 M wanted to go to the ski jump stadium because he loves winter sports (he is big into skiing and snowboarding) and is a big fan of the Winter Olympics. In the end we both agreed on the ski jump stadium. 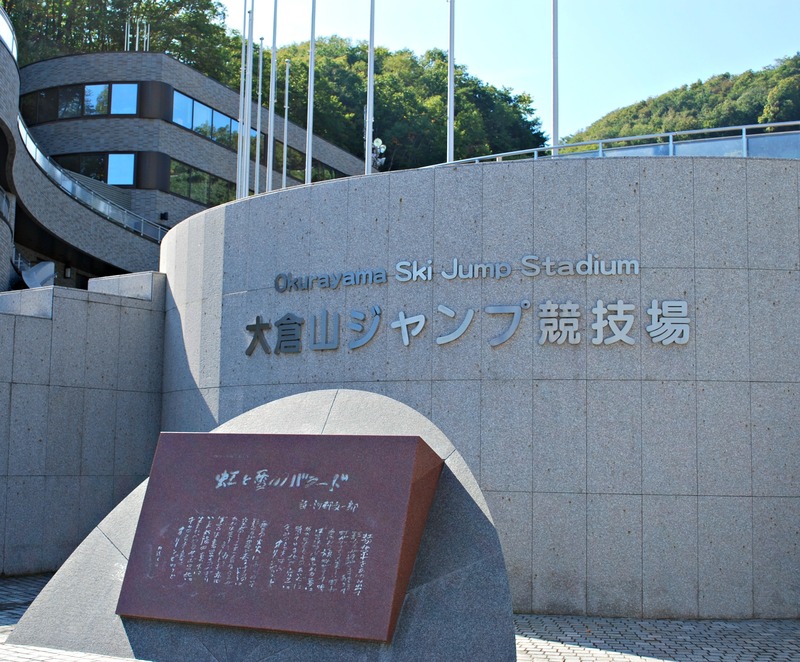 After all there were numerous parks in Japan we could visit, but probably only two Olympic ski jump stadiums (if the one in Nagano still exists). 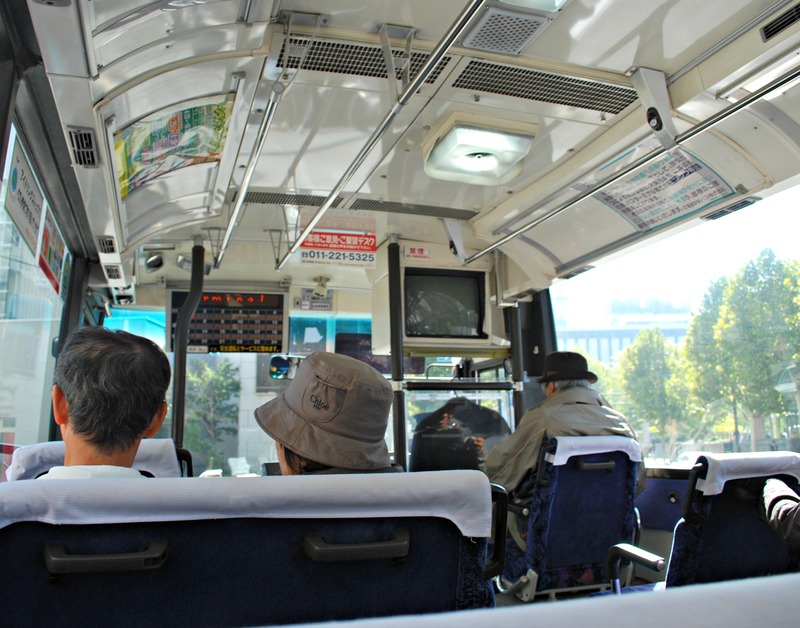 From the JR Sapporo Station, we caught the Sapporo Stroller Bus which stops at a number of popular attractions throughout the city. One particularly popular stop was the city zoo, at least half the bus’s passengers exited here. Since many of them had been small children, the bus ride was very quiet for the duration of our bus trip. 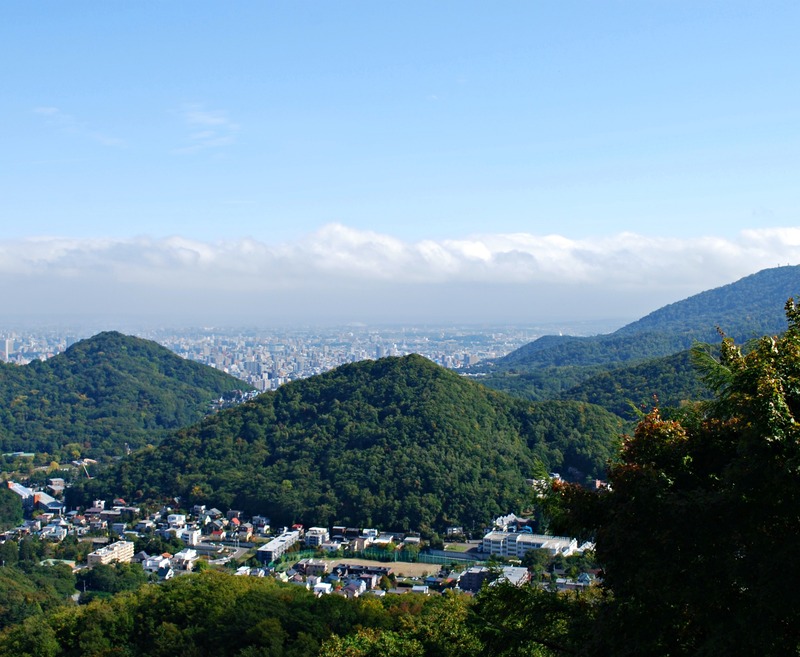 As we drove further and further away from downtown Sapporo, the scenery turned increasingly green and lush as we entered a mountainous area. 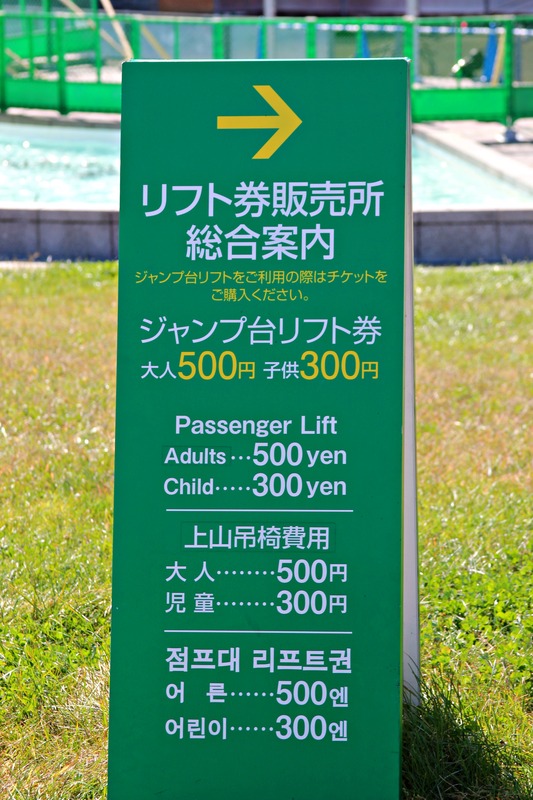 We continued to climb for a while more before the bus turned into a parking lot and the driver announced that we were at Okurayama Ski Jump Stadium. Although I had been excited at the idea of going to the Ski Jump Observatory all through the bus ride, upon seeing the Ski Jump in person I was having second thoughts. It was much, much higher in person than it had looked in pictures and the only way to get to the observatory was to take the chairlift. Since I’m not a fan of heights or chairlifts, I was now filled with heebie jeebies. But as M was quite excited to get to the top, there was no turning back. It was a pretty slow day at the Ski Jump Stadium and there was no line to get on to the chairlift. We were ushered onto a chair by a worker and before I knew it, we were moving up, up, up towards the top of the Ski Jump Stadium! At first, I was fairly nervous and had my eyes trained on the chair in front of us. But as we climbed up the mountain, I started to relax and look around a bit (although I didn’t dare look back down the mountain!). 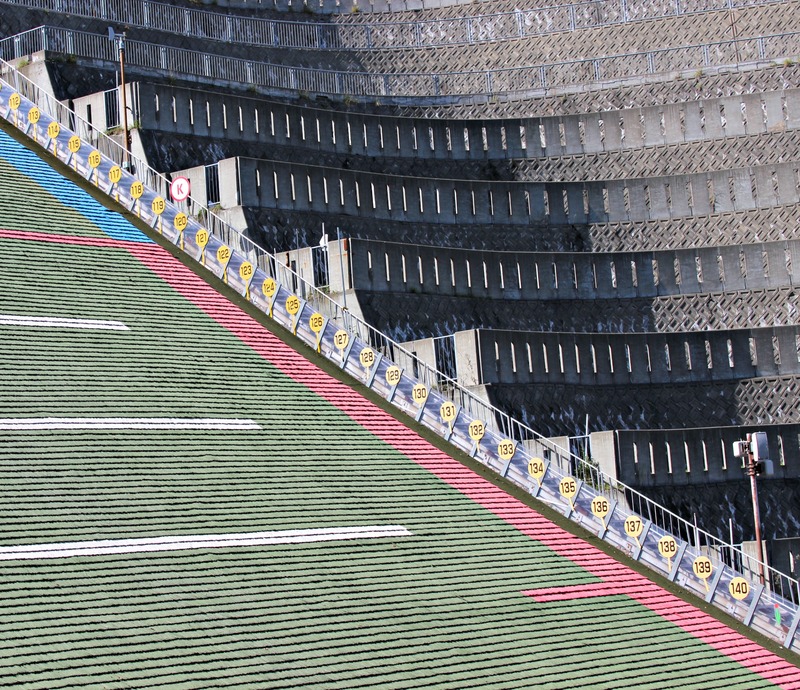 It was interesting to see the markers on the side of the ski jump indicating how far the athlete was able to jump. As the chair climbed further up still, the ride became less scary because our feet were so close to the slope of the hill. Still, I couldn’t wait to get to the top and be standing on my own two feet again. 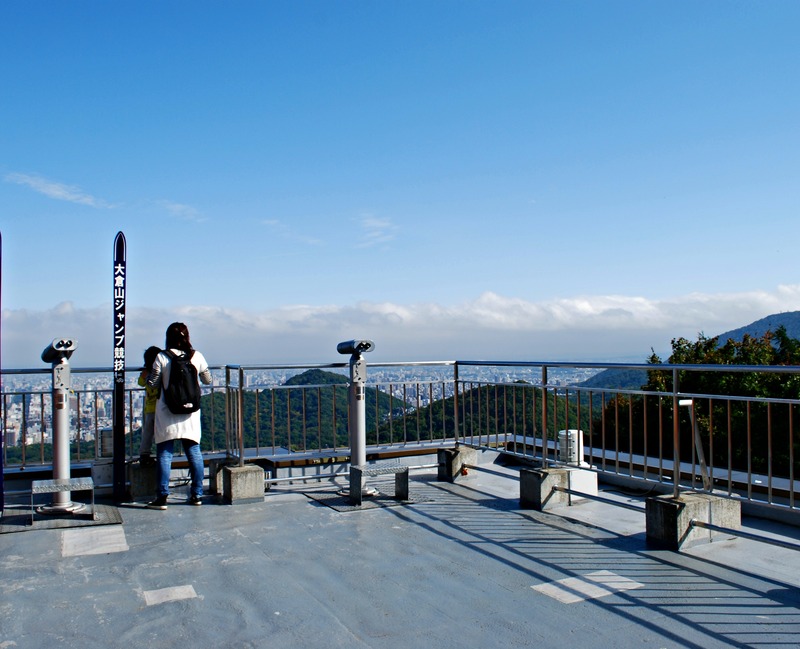 As we reached the top, a worker helped us out of the chair and we climbed a short flight of stairs to the observatory. The first thing we did was to look down at the ski jump. Just thinking about actually going down that thing and flying in to the air made my stomach churn. On the other hand, the views of the city were truly spectacular. We were glad that we had come on such a nice, clear day when we could see the city in all its glory. Then, in the distance, M noticed the Miyanomori Ski Jump Stadium. 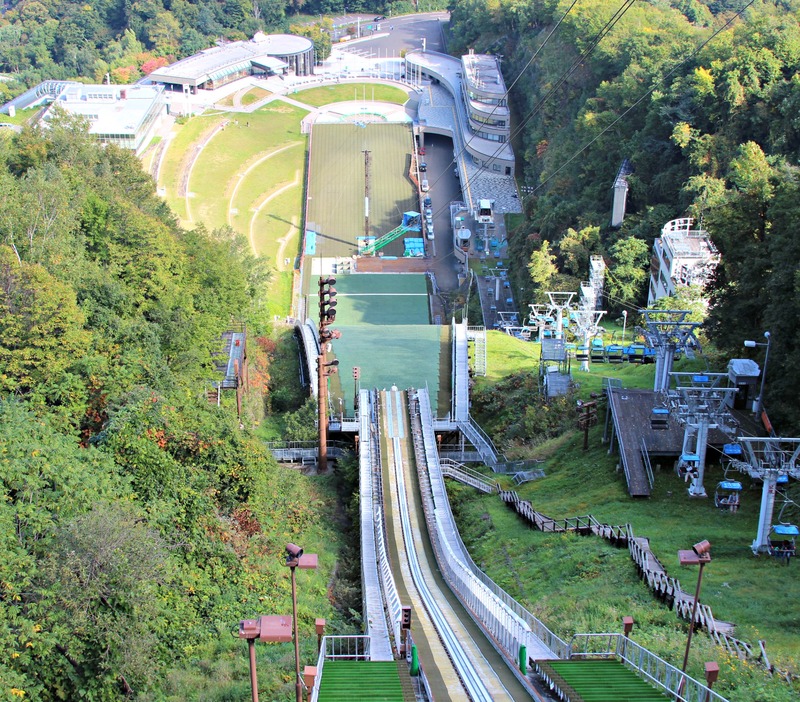 It had also been used in the 1972 Winter Olympics —- for the Normal Hill Ski Jumping and Nordic Combined. After taking in the views, we made our way down one floor to the lounge area. It was quite comfy and you could purchase Sapporo beer (what else?!) and soft serve ice cream cones (supposedly the most delicious in all of Sapporo!). I normally don’t turn down ice cream, but we’d already had so much during the trip that I decided to take a pass. Instead, I sat at the window, where there was a very good view of the starting point to the ski jump. 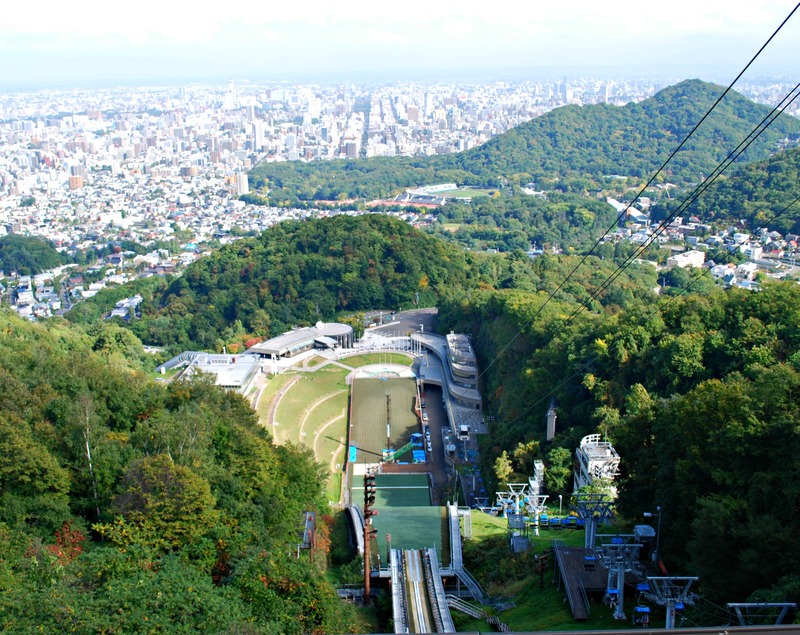 The Miyanomori Ski Jump Stadium, off in the distance. 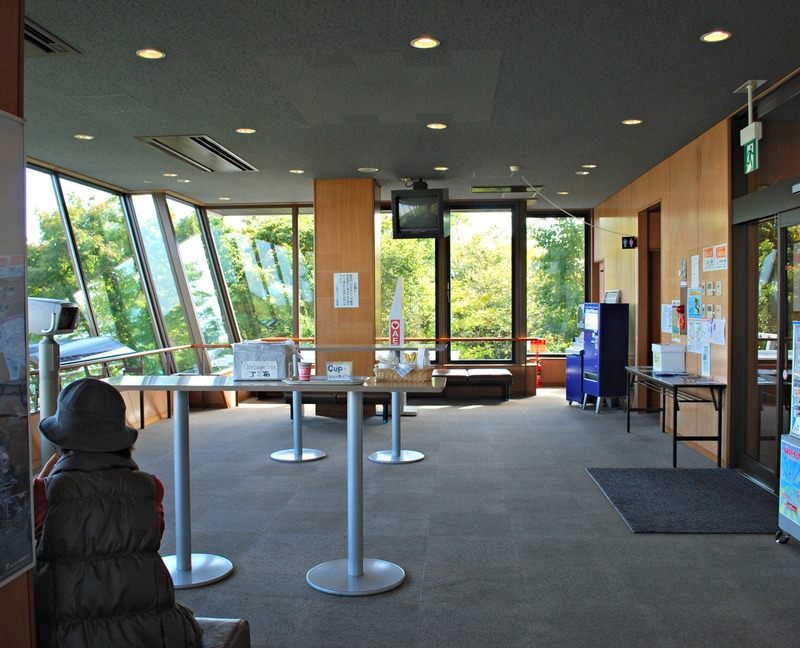 The lounge area, one floor below the observatory. A more close-up view of the top of the ski jump. Then it was time to get going. 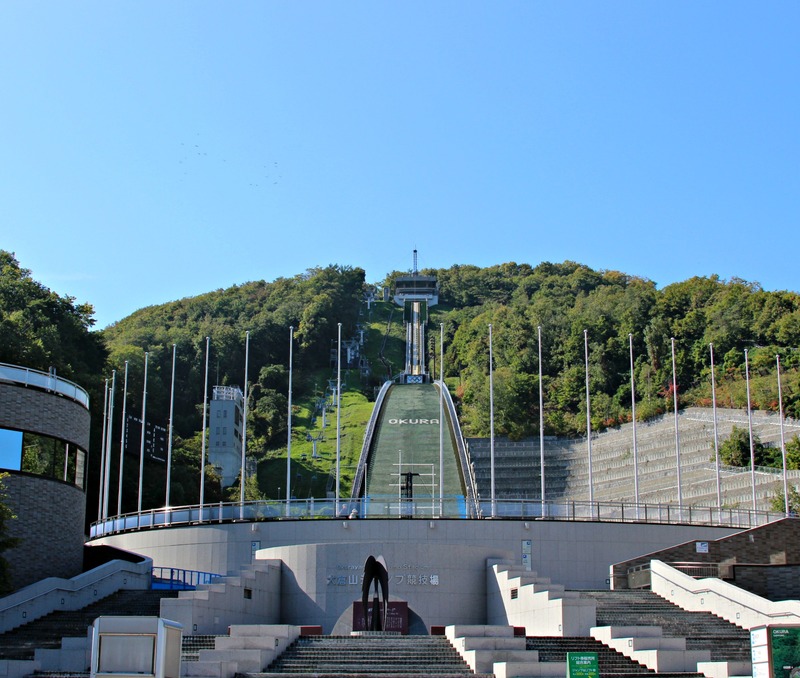 We still wanted to take a quick look around the Sapporo Winter Sports Museum at the bottom of the ski jump, as well as make it to Otaru while it was still light. This time I wasn’t as nervous to go on the chairlift since I’d gotten used to looking down the hill while we were at the observatory. The ride down was uneventful and as soon as we disembarked, we dashed over to the museum. 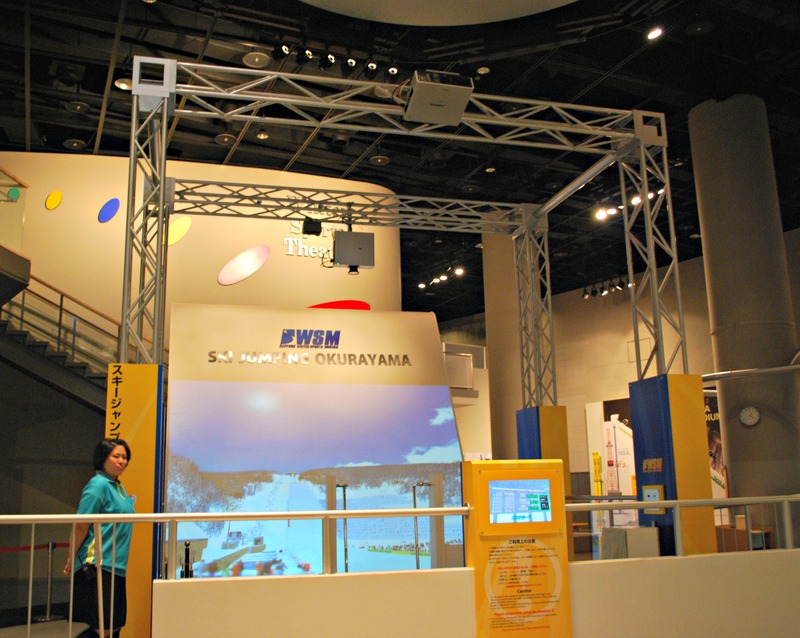 As it turned out, much of the museum was devoted to simulation games where you could experience the most popular winter Olympic sports. 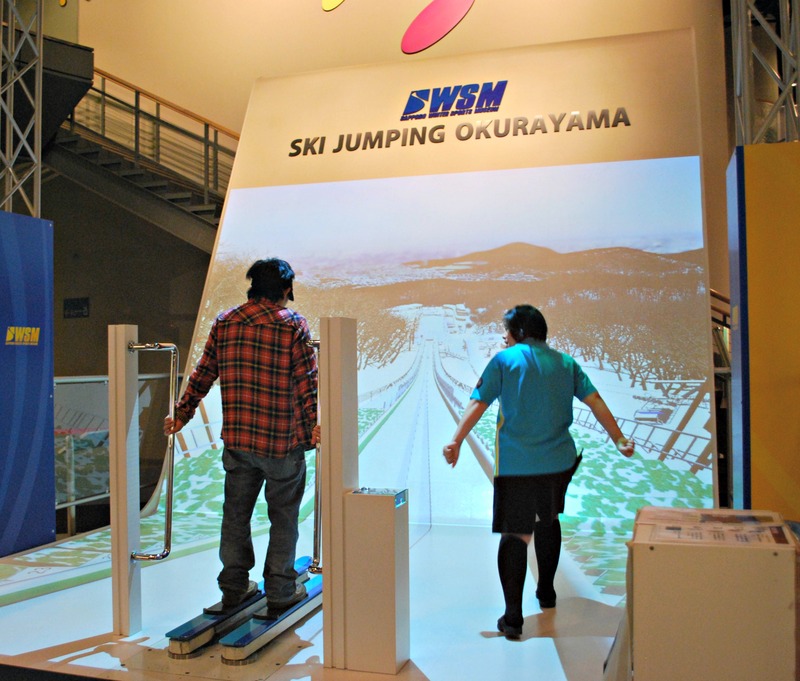 And, of course, one of them was the Okurayama ski jump. Even though we didn’t get a chance to do it, we watched as another museum visitor tried it out and his score was good enough to “medal”! Oh, we’d love to go to Nagano and see all the remaining Olympic facilities there. Yes, I always thought ski jumpers had to be some of the bravest people on the planet and getting a bird’s eye view of the top of the ski jump just confirmed it. I see Kasai got the silver, that is so awesome! I was especially excited when Hanyu won the gold in Men’s Figure Skating a couple of days ago. So glad to see Team Japan doing so well. I’m sorry the pictures weren’t showing up for you. No one else has commented on it, hopefully it was just a momentary glitch for WordPress and you can see the pictures now. 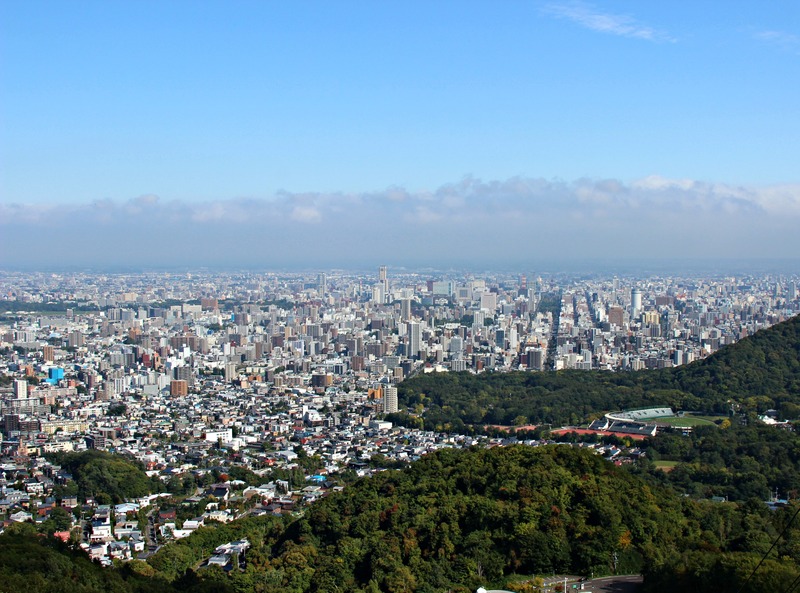 It was really wonderful to be up in the observatory and get such beautiful views of Sapporo. 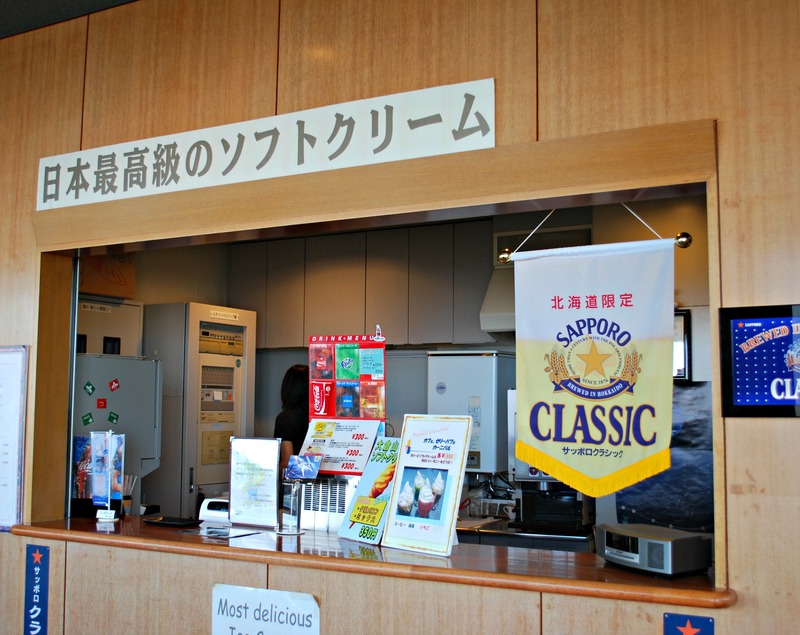 It would have been nice if they had Sapporo beer-flavored ice cream. Hehehe. Nice pictures and it really looks scary! Lol, with all the flavors of ice cream I saw during my trip to Japan I didn’t see any beer flavored ones! But you’re right, it would be a good idea and I’m sure that M, at least, would have tried it. It’s a funny thing, he doesn’t drink much when we’re at home, but in Japan he’s guzzling the beer like there’s no tomorrow. I guess the real Japanese man in him comes out in the old country haha! Agree. Hehehe. Usually the real person shows up in his/her hometown. It’s a funny thing, M was born and raised and has lived his whole life in Southern California (same with me). Yet, when we’re in Japan, I see him really trying to adapt and fit in with the locals. Which for Japanese men means lots and lots of drinking, I suppose! That looks like a really interesting place! I’d love to be able to look at that view, it’s beautiful so high up (*＾ワ＾*) And if the soft cream’s supposedly the best in Sapporo, it must be seriously amazing! I know, things have been so crazy hectic around here, I’ve hardly had a chance to log on to WordPress. Makes me so sad, I love reading blogs and blogging! Watching the Sochi Olympics really inspired me to hammer out this post even though I was dead tired. Thanks so much for always commenting! Yes, it was so interesting to go to the Ski Jump Stadium, especially the observatory with its wonderful views of the city. In all honesty, I have to wonder if that really was the best soft cream in Sapporo. The sign there said that but I think they were exaggerating. I didn’t mention it in the post but we got some soft cream in the cafe attached to the museum at the bottom of the hill and it was just alright. And I’m guessing their soft cream came from the same source lol. Wow, I’m glad to see they’ve kept this facility in such good shape, more than 40 years after the event it was built for. I assume it’s still used for winter events these days? 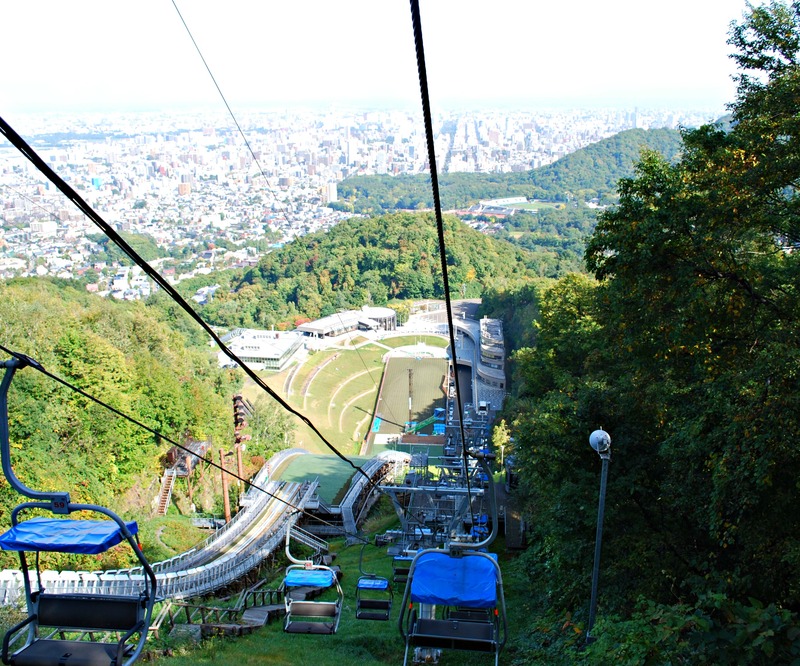 I didn’t make it to Okurayama in my recent visit to Sapporo, though as far as Winter Olympics mania’s concerned, it was well nigh impossible to avoid the hype these last couple of weeks. Nearly every major channel was covering Sochi in some shape or form, posters were popping up everywhere, and after Japan started raking in medals the coverage became almost overwhelming. I did manage to catch footage of the ski jump event and was impressed by the skill of the participants – I can well imagine they’d need a slope as high and long as the one you visited to do it properly! The ski jump does look pretty nice given how old it is. I think it was actually constructed way before the 1972 Olympics so it’s held up very well. It’s still used in ski jump competitions to this day. 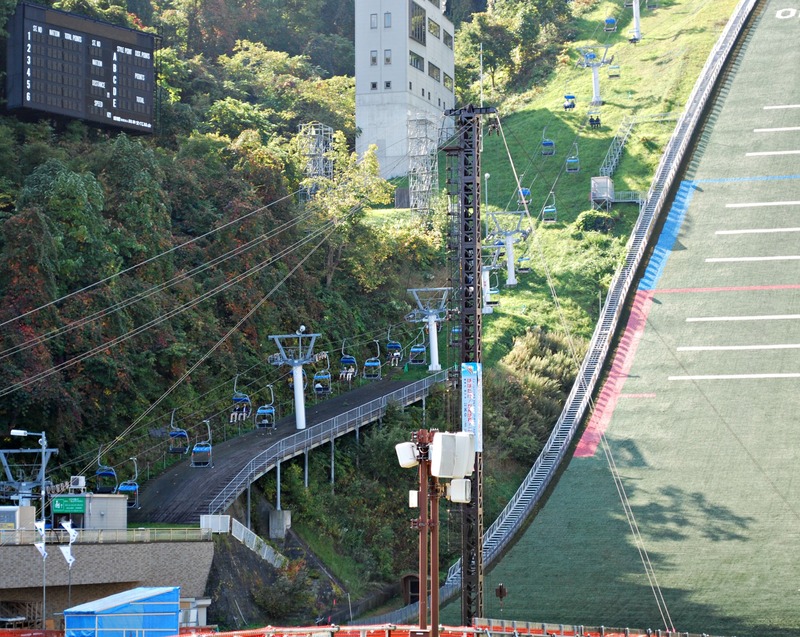 I have to give a lot of credit to those ski jumpers….I can’t even imagine doing what they do. The Japanese love the Olympics! I’m glad to see Team Japan raking in the medals, it seems they haven’t fared so well in the last couple winter ones. Here in the US, the mood is a lot more subdued with Team USA doing nowhere near as well as had been expected. Speed skating, in particular, has been a real disappointment. Those are amazing views of the city! 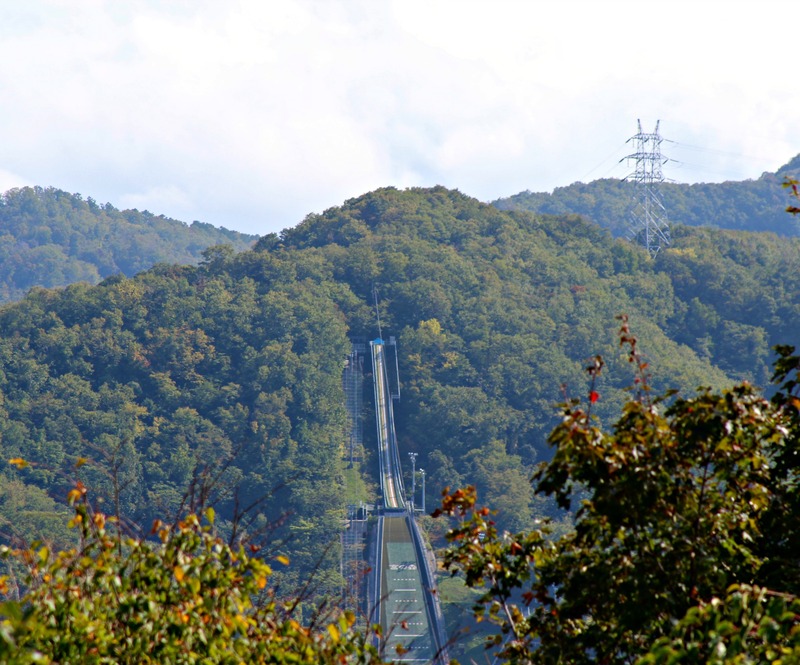 I guess I never realized the ski jump was THAT high…O.O i’m like you, I’m a little wary of heights. Yes, it was wonderful to see all of Sapporo laid out like that from the observatory. I’m wondering if the ski jump looked especially high since it wasn’t blanketed in a layer of snow. But no matter what, I’m sure I would never be able to do it! 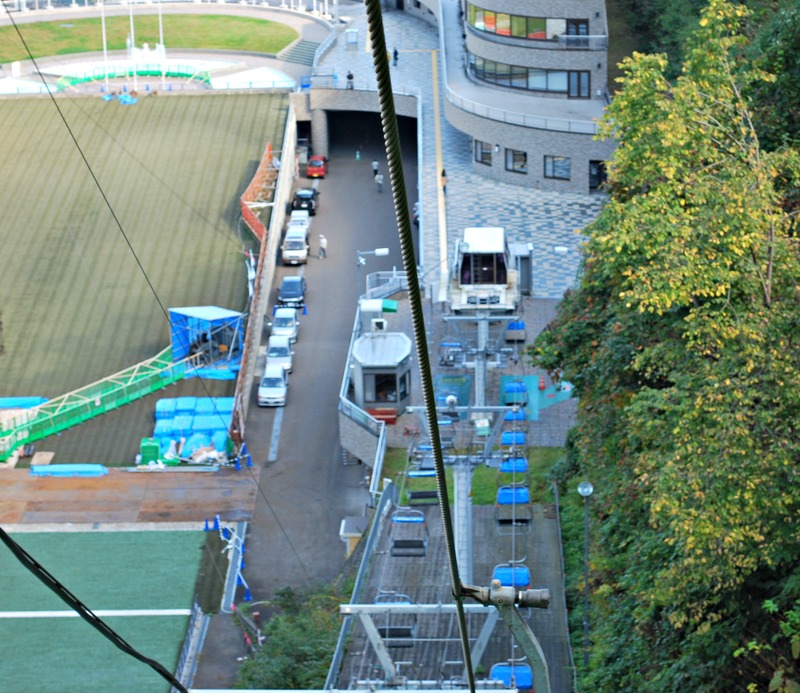 Yeah, I know, it was so interesting to see it from the view of the ski jumper. I don’t know how they do it. Just looking at those photos reminds me why I’m not an Olympic ski jumper! Interesting to see how it’s put together, though. I have to admit I have a whole new level of respect for ski jumpers. I always thought what they did was pretty crazy but looking at the top of the ski jump from their point of view made me realize just how brave they are. Wonderful photos! I really enjoyed reading about your visit. I love the Winter Olympics too (especially figure skating, but I watch it all). I would be so terrified to ride that lift, though! So I appreciate what you went through for the experience. Thank you! I love figure skating too, I’m so thrilled that Japan got their first gold in the men’s competition. 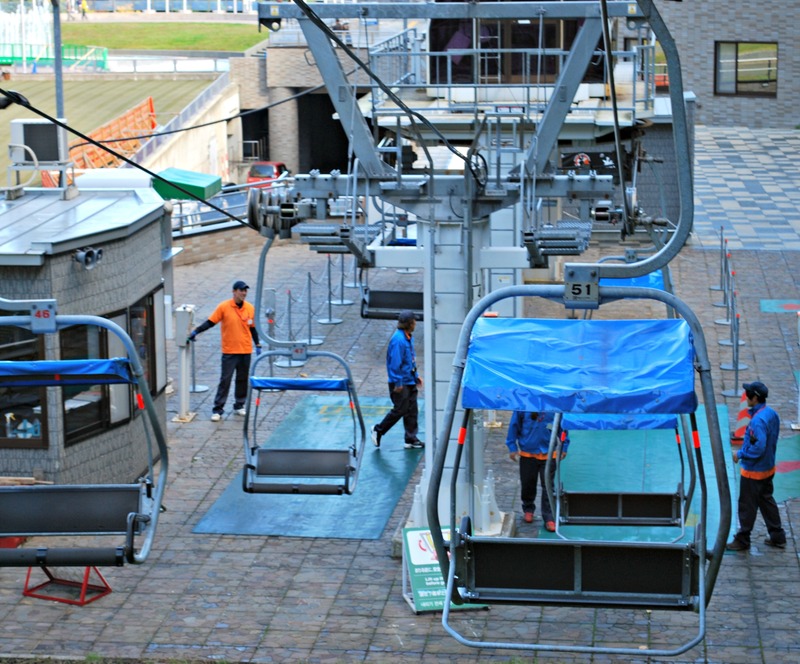 Riding that lift was a bit scary, I really hate the feeling that my legs are just dangling in open space. 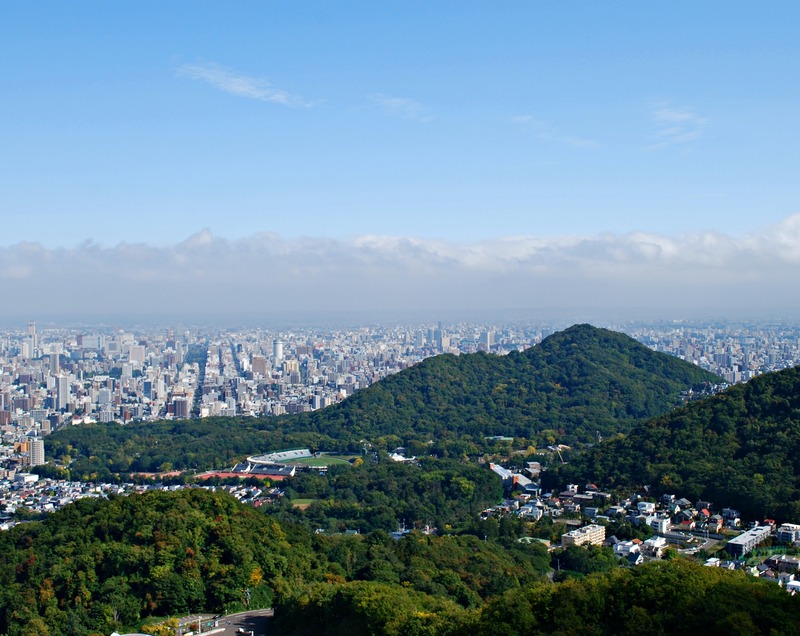 Still, it was worth it for the views of Sapporo, just spectacular. Ah yes, the view was very nice. It was worth it to take the lift up even though I was a bit scared lol. I can imagine that! LOL. those ski lifts are so scary. i went snowboarding a few years ago and it was my first time on the lift… for some reason, i didn’t jump off when i should’ve and instead jumped off 30 seconds later, before it went back down… i landed just inches away from a steep drop off the mountain (so scary). seriously, those olympic ski jumpers are incredibly brave and must have crazy amounts of adrenaline… those heights are terrifying! 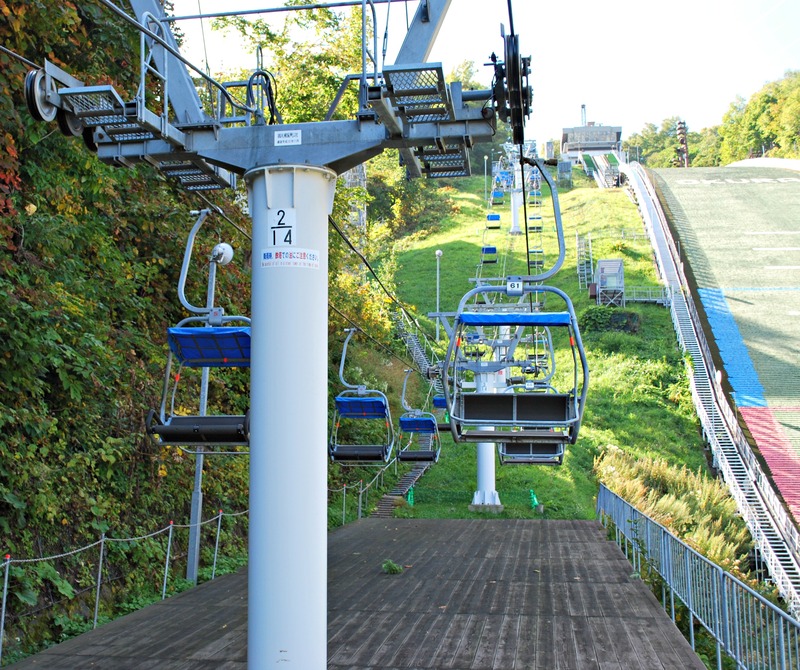 Oh my gosh, your first experience with a ski lift sounds terrifying! I heard it’s tricky jumping off the ski lift with a snowboard in the beginning. At least at this ski jump stadium, there were workers helping you get on and off the lift. I have a new appreciation for ski jumpers having now seen how things look from the top of the jump. It was so much higher up than I could have ever imagined. Yes, lots of bravery and adrenaline must be required! Woahh!! Great post – very befitting for the Winter Olympics in Sochi! 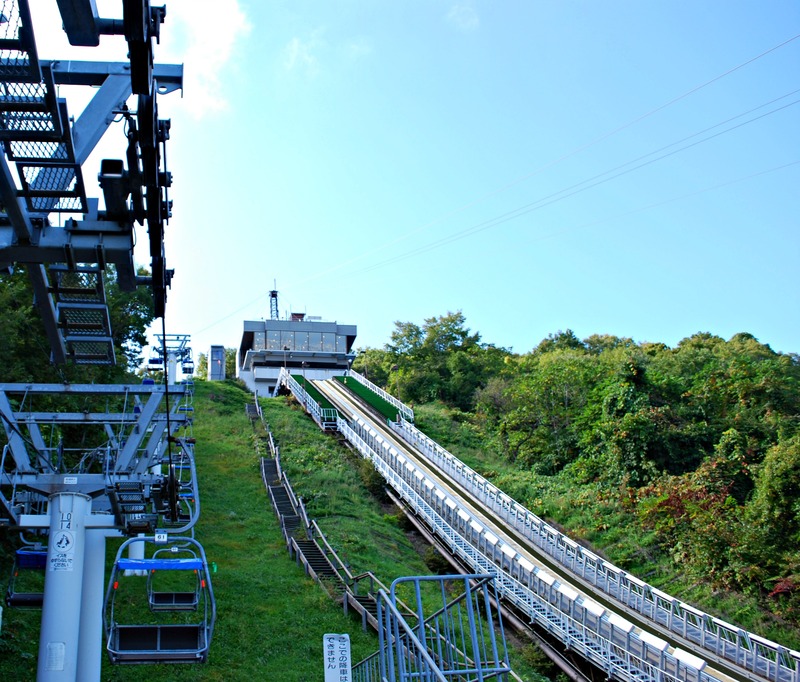 When I was reading your post at the beginning, I have to admit that the ski jump didn’t look that steep but when I saw the photos you took when you were getting on the chairlift, I was gobsmacked. It looks really scary! You’re so brave!! (>.<) I always get that butterflies-in-your-stomach feeling when I'm at theme parks, so I can imagine what you must've felt like. I really hope you’ll get a chance to go up to Sapporo before you return home. They have some of the best food up there, especially the seafood! Yes, I was a bit frightened when sitting on the lift going up to the top of the ski jump stadium. If M hadn’t been with me I would never have done it in a hundred years! I really hate the feeling of my legs dangling in open air, it makes me feel so unbalanced and unsteady. But it was worth it to get to top and see the views of Sapporo. Wow, 40 years ago, that was right after the Olympics were held there. I imagine the views of Sapporo must have looked quite different from the top. I’m sure you’ll have a great time when you go! My boyfriend loves chairlifts too and was having a great time as we climbed up towards the top of the stadium. It would be interesting if there was still snow when you went. You would really get to see it from the perspective of the Olympic athletes. Thank you for your kind words! Our visit to Hokkaido was wonderful, I hope you will get to go someday soon. The food in particular was some of the best we’ve ever had in Japan. We’ve only gotten to see Sapporo and Otaru and Hakodate so far but I really hope to make it to Furano on a future trip. It looks so beautiful in pictures. I’m sure there are people who would love going down by zip line. Not me, I’m such a ninny! It was hard enough using the lifts to go up and down lol. Hey! I also haven’t blogged for a while haha. Although I’m a bit late in commenting, glad to see that you’re posting again! I guess for people with a fear of heights, the ski slope must be a nightmare! My bf doesn’t like heights too so I won’t be going to any ski slopes stadiums anytime soon. Well, at least not with him!